England batsman and Yorkshire captain Gary Ballance has announced that he is taking a break from cricket for "personal reasons". In a press statement, Yorkshire said Ballance will miss several one-day games and asked for his privacy to be respected. Yorkshire said that they have granted the 28-year-old "time away from the game" and he will miss "several" One-Day Cup matches, starting at Durham on Friday. Ballance, who captains Yorkshire in all formats of the game, missed last week’s Championship game against Surrey where they suffered an innings defeat. In a rare domestic appearance, English captain Joe Root took over the team's reins instead. At the time the club had said that Ballance was ill. Then on Friday, Yorkshire confirmed that he would be taking a break as they announced a 13-man squad set to play Friday's 50-over match against Durham at Chester-le-Street that did not include him. The mantle of captaincy has been given to pace-bowler Steven Patterson. "We also ask that his privacy be respected during this time," said a statement. It has been a tough few months for Gary Ballance - who has 23 Test caps for England so far. He lost his place in the English line-up in March when he was left out of the squad for the New Zealand series after having spent the entire Ashes tour as a batting reserve. Right from his senior debut, Ballance has been a very popular member of the England squad. The belief that when an indispensable player retreats from the game, another one often rises to the challenge was exemplified by him as he made full use of the England chance offered by Jonathan Trott's retirement following a stress-related illness. In no time, Ballance's nuggety left-handed batting style proved to be the backbone of England's line-up. There was nothing stylish about his approach, but his discipline and shrewdness were apparent and he could step up the tempo when necessary. One of the first moves made by Joe Root when he became Test captain last summer was to recall Ballance against South Africa. Ballance began by struggling against some high-quality Proteas' fast bowling, and just when he appeared to be gaining confidence, he broke a finger and missed the rest of the series. Post his comeback, Balance was named in the 30-man Ashes squad. In Australia, the English failed spectacularly in almost all departments as they lost 3-0. Still, Ballance was not considered worthy of a recall and was dropped for the New Zealand tour, losing his place to Liam Livingstone. Ballance was also absent from the squad named for the home series against Pakistan next month. Altogether, in 23 Test matches, Gary Ballance has amassed 1498 runs in 42 innings at an average of 37.45, including four 100s and seven 50s, his highest score being 156. He is predominantly a Test batsman, having played only 16 ODIs so far, with much less impressive statistics. 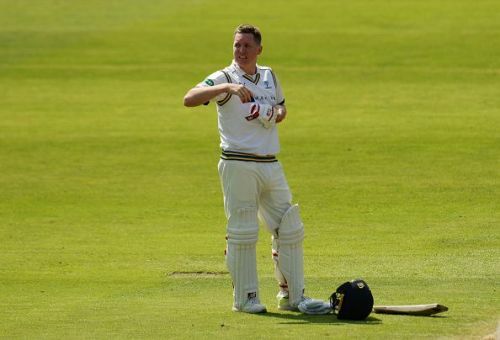 Ballance is one of county cricket’s most reliable batsmen and he will be sorely missed by Yorkshire, who will be hoping for him to return in time for their Championship campaign which restarts on June 20. Yorkshire have had mixed fortunes in the Championship season so far. They were bowled out for 50 by Essex, their lowest score in the past several decades. They also lost by an innings at the Oval last week.